Manage your to-dos effortlessly online. Cling lets you manage your tasks just as easily as all other content. Effortlessly note down your to-dos while working on your projects. Create lists of your tasks, manage their status and prioritize quickly and easily. Cling is still being primed to support you comprehensively with your tasks. We’re busily working on it and once finished you’ll be able to define who needs to complete which task and by when. Text cards ➊ are used to manage your reminder lists and to-dos online. Completed tasks can either be archived (checked off) or deleted in the card menu ➋. 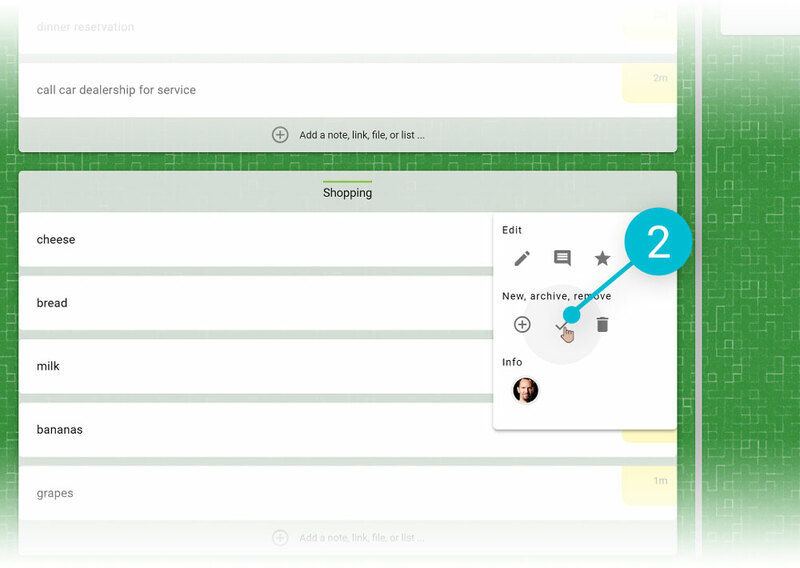 You can move your tasks around on a board via drag and drop. If you attach a task card to another card, you’ll never lose sight of a task’s context again. Should you wish to learn more about the general functions of cards and boards, we recommend that you first take a look at the “Basics” section. Tip: Use the archive button for frequently recurring tasks. Archived elements can be displayed again ➌ in the board menu. You can then easily retrieve the recurring task from the archive.